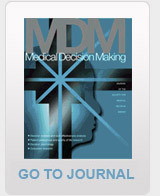 "Medical decision science is a field that encompasses several related pursuits. As a normative endeavor, it proposes standards for ideal decision making. As a descriptive endeavor, it seeks to explain how physicians and patients routinely make decisions, and has identified both barriers to, and facilitators of, effective decision making. As a prescriptive endeavor, it seeks to develop tools that can guide physicians, their patients, and health care policymakers to make good decisions in practice." SMDM members contribute critically to health policy research in the areas of evidence-based medicine, cost effective health care, patient decision making and public health. SMDM helps you to be more than just a face in the crowd. The connections you make through SMDM can help you build a network of long-term contacts to help you throughout your career. "After 30 years, the world has caught up with what people in SMDM have been doing all along."